This is an Amazon.com best selling audio-book. Emotions as Tools: A Self Help Guide to Controlling Your Life not Your Feelings is an easy to understand guide that reacquaints you with your feelings and helps you learn what your feelings are and what they can do for you in your relationships and in your life. The guide focuses on the emotions of anger, sadness, anxiety, fear, guilt and shame. Emotions as Tools is for you if you have ever wanted your feelings to just disappear, you believed your feelings controlled you or you do not know how to express your feelings appropriately at home, socially, or at work. You can get a “look inside” or listen to an audio sample from the book by clicking on the link to Amazon below. 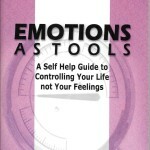 Emotions as Tools is available as a print book, an e-book and an audio-book.